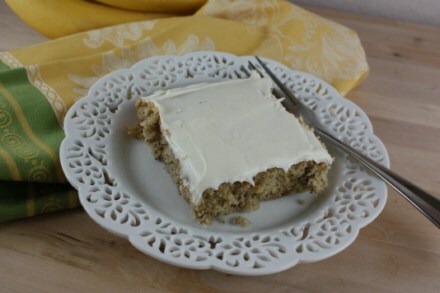 I have been making banana bars for years. I recently adapted my family’s favorite recipe and made it gluten free. It turned out so well. 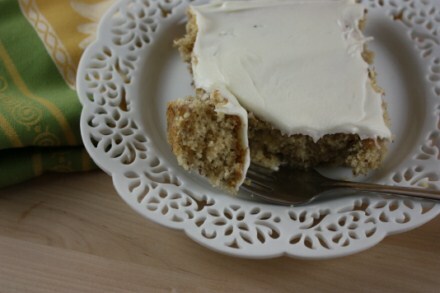 This is another one of those recipes that with a few tweaks worked so perfectly gluten free. It had the exact texture that banana bars should have. I have read and tried many gluten free specific recipes over the last year, but I am having the best success with adapting the recipes we already loved. Do you cook mainly from gluten free cookbooks and sites, or do you prefer to adapt regular recipes to be gluten free? In a mixing bowl, cream butter and sugar. Add the eggs, sour cream and vanilla. Combine the sorghum flour, potato starch, tapioca flour, xanthan gum, baking soda, and salt and gradually add to the creamed mixture. Bake at 350° for 25-30 minutes or until a toothpick inserted near the center comes out clean. Cool. For frosting, in a mixing bowl, beat the cream cheese, butter and vanilla. Gradually beat in enough confectioners’ sugar to achieve desired consistency. Frost bars. Store in the refrigerator. The bars look good! I do have a couple reliable gluten free cookbooks to depend on, but if you have family favorites from before, I think it is important to find ways to adapt them to be gluten free. But, let’s face it, some things are much easier to convert than others. Things like pie crusts, yeast breads, and doughnuts are pretty complicated and I always start with another person’s recipe first.